Hey guys! 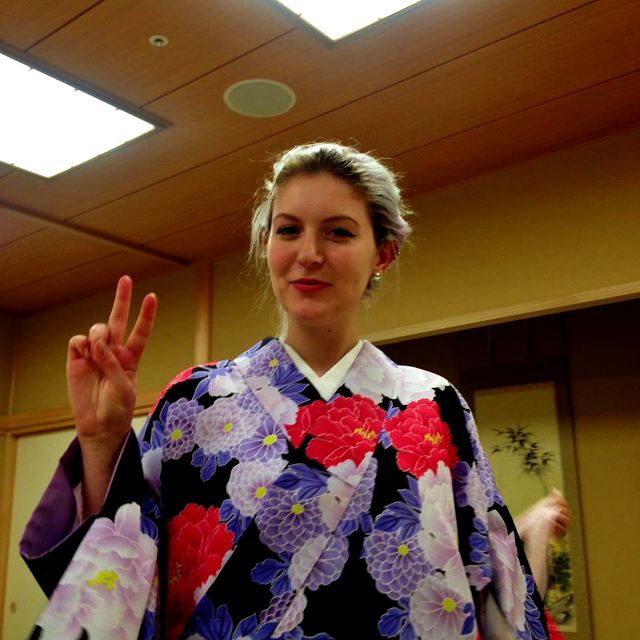 So an uber Japan orientated post today, I had the amazing experience this week of being able to wear kimono and thought I'd share the photos. The exchange student center at my university here often offers odd jobs to exchange students, and a fancy department store in Tokyo was looking for some foreign students to model kimono (we had no idea why, especially as a) we are not japanese and b) we were wondering why they wouldn't go to a model agency for that sort of thing and c) I clearly have the model qualities of a spoon). So after class I hopped on the first train and went to achieve my model destiny. 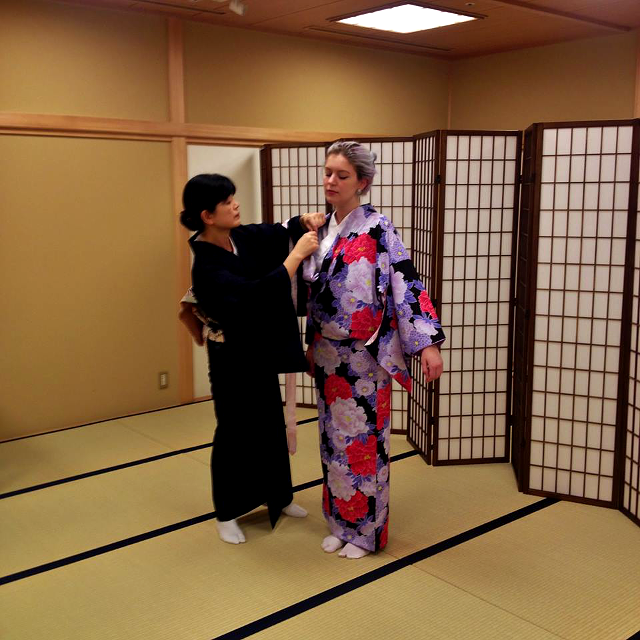 It turns out the department store runs a Japanese experience for tourists and people living in Japan for a short time, so foreigners can experience things like wearing kimono, tea ceremony etc. They wanted to take pictures in order to advertise the kimono side of the experience, so we had photos taken off us choosing our kimono, being dressed, and then walking around the neighbourhood of the area and visiting a shrine. 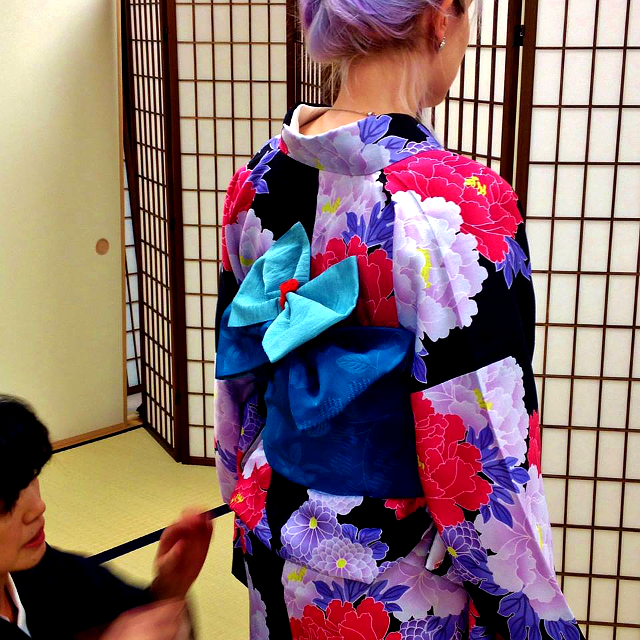 First of all it is a pretty long process being dressed in kimono, I reckon it took about 15 minutes each to be dressed? There are a lot of layers involved, padding, tightening and tying bits in place til your body has the 'tubular' look that kimono expresses. After about 10 minutes of being in a kimono (which is essentially like wearing very tight spanx on your torso while looking extremely elegant on the outside), I realised I couldn't breathe has deeply as I would've liked to so kind of had to keep myself calm haha, but as long as you don't panic it's fine! Also going to the loo would have been impossible, we didn't even attempt to. I'm guessing when people wear them they have to invest in a SheWee or get a friend to help. Going for a walk in the neighbourhood was hilarious, as our gaijin feet were too big for the geta (sandals) and the fact kimono doesn't allow you to step far meant we struggled to walk; and the area is full of businesses so we had loads of salarymen and passers by taking pictures of us on their mobiles, and trying to make us laugh while our picture was being taken! they are beautiful! I love kimono. pretty cool that you got to be part of their campaign too! 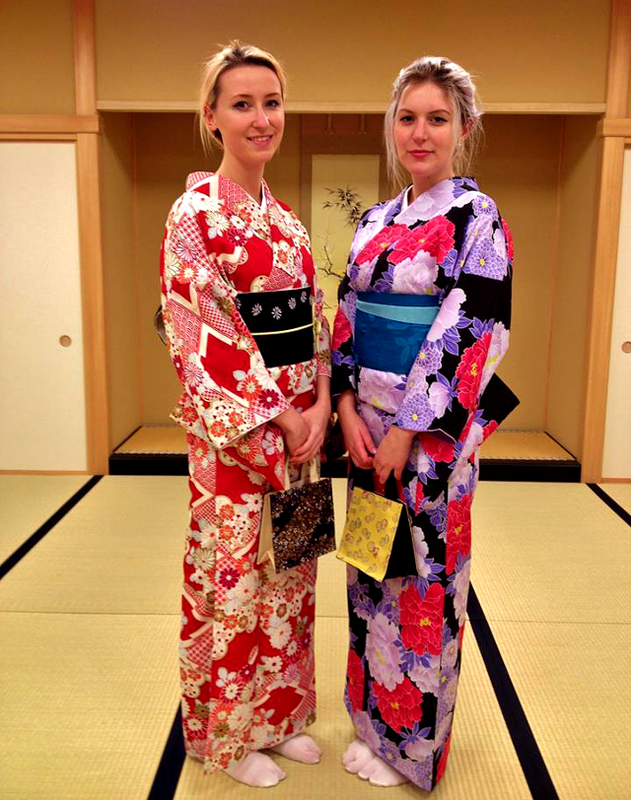 You look very beautiful wearing a kimono. Looks greet on you, I remember trying on a Kimono a while back and it was so hard to move properly especially with the shoes. I love this! 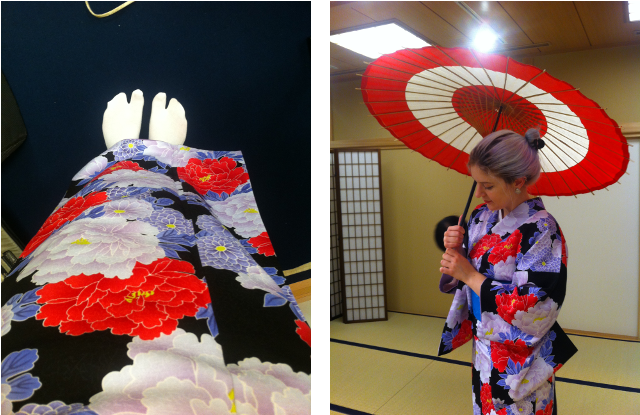 It's so cool how you got to model for something like this *u* You look so nice in your kimono~ great post! This is such a cool experience! I never realised kimonos were so restricting though. I wore a sari in India last year and that's pretty restricting, no going to the toilet in them! Haha this is great!! Looks like a really fun time!